The lovely team at Plush Addict are busy moving into a new warehouse shop space in Peterborough but there online shop is available as usual and orders are being processed. As usual, there are lots colourful new arrivals just in so for my January 2019 sponsor choice I've chosen a couple of rainbowtised quilting collections as well as a gorgeous dressmaking rayon viscose along with some hab-dash suggestions for handling/sewing this fabric as well as some garment patterns selected with rayon viscose in mind. 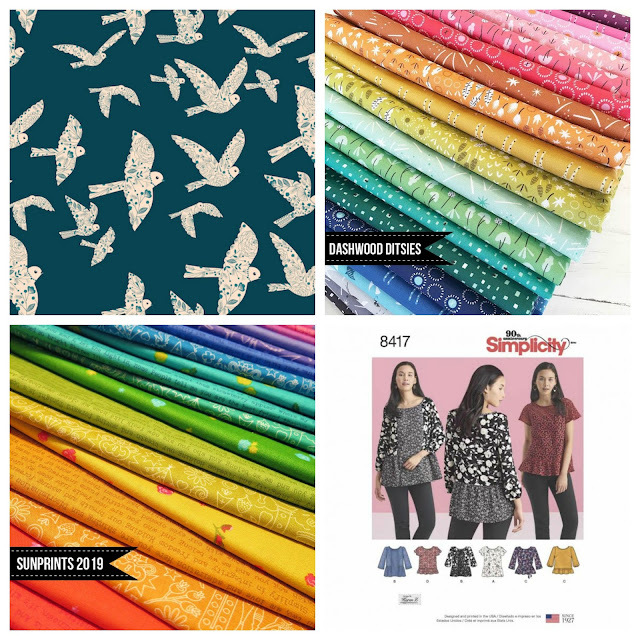 Andover Sunprints 2018 Fat Quarter Bundle 27 fabrics Alison Glass's fabric collections offer a giant blast of saturated colour with a multitude of prints. Sunprints 2018 include a text print, florals, doodle outlines in different colourways. Also available as individual yardage. Dashwood Studio Ditsies Fat Quarter Bundle 20 Fabrics Small scale prints in a wide rainbow of colours, Ditsies is a new cute collection and the designs range from leopards and birds to geometric dashes. Each print also available as yardage. Dashwood Flying Birds Rayon Viscose Wide width dressmaking fabric from Dashwood. This print followed hot on the heels of their Dovestone dressmaking fabrics (also rayon viscose). This is a fluid fabric with great drape. It does need gentle washing and careful handling. I like to use Schmetz Microtex 70 needes as they are super sharp and pierce the fabric nicely. Rayon can easily get caught or snag on thick or old pins so fine pins used in the seam allowance only are a good idea. Simplicity 8417 Pullover Tops with Sleeve and Fabric Variations. I picked this pattern as it's a great style for the Dashwood rayon/viscose and there are so many variation within the pattern. There are no closures to worry about, style options variations with and without bust darts, ruffles are still popular and there are some different ways to add them. If you'd prefer a dress option, Butterick B6481 is a style designed with rayon viscose in mind and I couldn't resist this Jumpsuit Butterick B6220 (full-length version) which would look great in the bird print.